For Christmas my husband bought me a voucher to spend at my favourite gallery - The Itch Gallery in Oakham. Jenny Creasey, the gallery owner, holds regular workshops there, where you get to learn new crafts from professional artists, so this was the perfect gift for me. I decided to book myself onto the Design and Lino Print Stationary workshop being run by Victoria Satchwell as this was something that I've been wanting to revisit for a while and I loved the idea of learning from an expert. I had tried lino printing when I was doing my A level Art Textiles and I remember how much I enjoyed it - I spent days laboriously cutting out a detailed image of a centaur from a very hard piece of lino tile - but that was over 20 years ago and my memory of the technique was a little hazy, so I really wanted to get a refresher lesson from someone who knows the craft well. 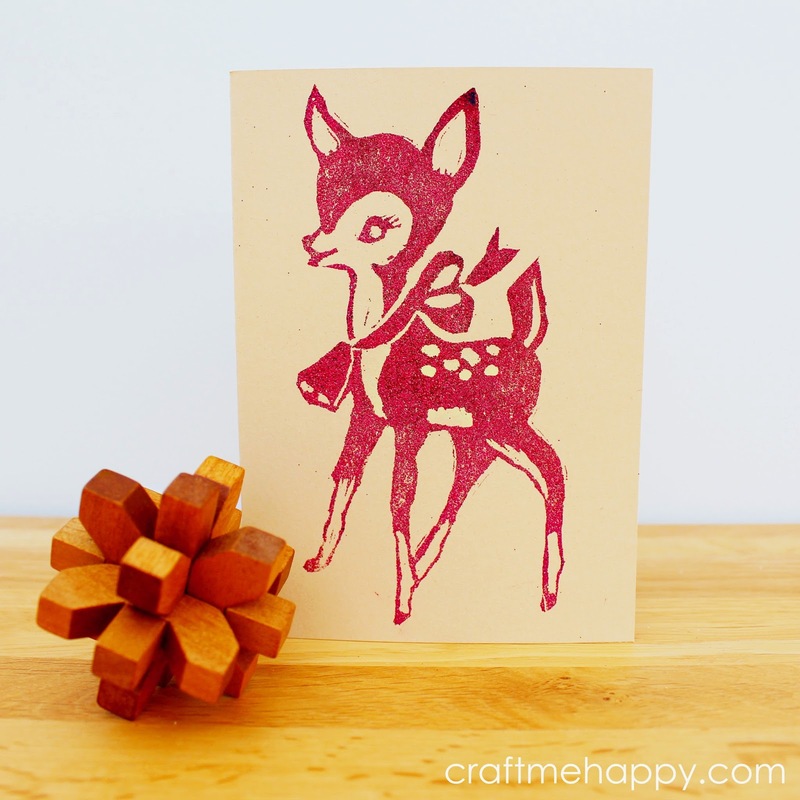 Lino printing is a relatively easy craft to try as the materials aren't overly expensive. Although nothing beats getting tuition in person, there are plenty of tutorial videos on YouTube if you just search for "how to linocut." A lino cutting tool . A piece of lino printing block to carve into, whether it's true linoleum, soft cut or transparent block printing sheet . Ink or paint, a brayer and a tray. Alternatively you could use an ink pad designed for rubber stamping. Optional heat gun and embossing powders . Scissors or a scalpel are useful but not essential. Before the course I tried to think of a design that I would like to turn into a print for stationery. I thought that a Christmas motif would be the perfect choice, as then I could create my own wrapping paper, gift tags and make several cards from the same lino cut. If I was going to spend a few hours cutting out a design, it would be a shame to use it for just one application. I love the 50's style retro fawn and so I found an image of a vintage 1950s watercolour illustration that I thought would be a perfect starting point. I loaded the image into the drawing app, Inkbot and followed the outline, trying to make a simpler, more stylised monochrome version of the image, altering the design to make it my own. Inkbot is great as it smooths out your lines, so even the shakiest hand drawing can look smooth and flawless. I then opened the image up in Photoshop and filled in the parts that I wanted to be black. When I got to the gallery I realised that I was the only one who had brought a design to reproduce. The gallery is the perfect place to be when you're stuck for inspiration, as you're surrounded by beautiful objects and imagery. I was very thankful that I had come prepared though, as my design is quite detailed and from past experience, I knew that it would be tricky to get it finished in three hours. I was given a piece of soft cut lino, to transfer my design onto. I held my inkjet printout firmly over the lino and scribbled over the back in pencil. At the time it seemed that the light grey transfer of the inkjet ink would be fine for me to cut around, but in retrospect it would have been helpful to go over my design in permanent marker pen because, as the cuts built up, they created shadows which, after a while, made it difficult to see where I needed to cut and where I needed to leave raised. Also, just holding the design with my hand gradually removed quite a lot of the inkjet image. I had to keep holding my design up for it to catch the light so that I could then see where I still needed to cut. The lino cutting tool was still the same one that I used as a teenager but the soft cut lino was infinitely easier to cut and carve into than the piece of hard lino I had to work with in the 1990s. This stuff is great, like carving into a rubbery hard cheese. My design had quite a lot of fine lines which, once I'd seen some beautiful examples of Victoria's work, I knew would be too fine, so I thickened a lot of the lines so that they were around 1mm thick. I also filled in the bow and the bell part of the design as Victoria advised me that these would be a bit too fine. When my image was finalised it was time to have a play and familiarise myself with the lino cutting tool. The outer part of the lino was going to be cut away later, so it was a great place to have a play. I started drawing lines, circles and various details from my design to practise and improve my technique before I took a blade to the actual design. 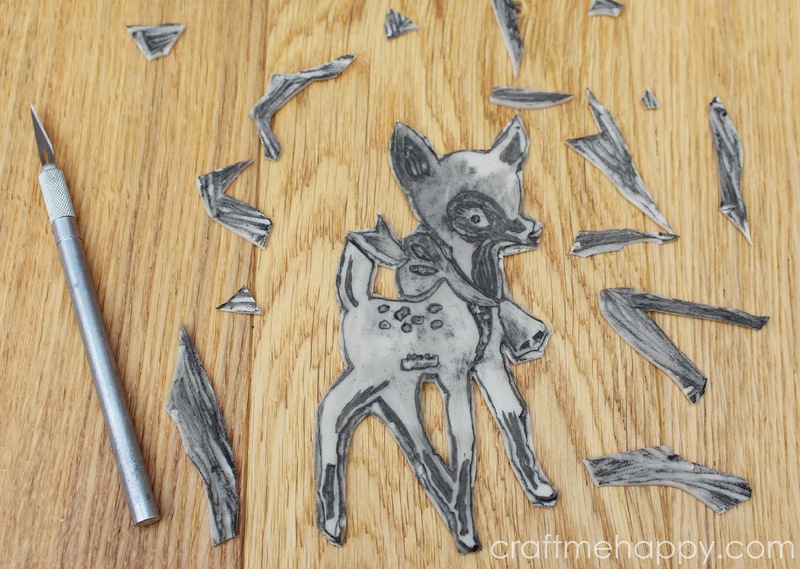 The lino cutting tool takes quite a bit of practise to perfect the technique. I had to keep reminding myself not to put too much pressure on and to keep the angle of the blade quite shallow. I got carried away so many times and found myself digging deep tracks into the lino and then getting stuck. Throughout the design I used the smallest blade available to me. I found that, as a novice, I was able to control it so much better than the larger blades. If I needed my cuts to be deeper, I just went over them a couple of times to get more definition. I did briefly attempt a slightly larger blade to cut out some of the background, but I found I was having to use more strength to cut, which put me at a greater risk of slipping and damaging my design. I did nip the very top of his ear off while I was using the larger blade, so I quickly changed down a blade before I caused any more damage. I should probably also warn you that these cutting tools are sharp so you need to cut away from yourself and try to keep your hand behind the blade of the tool. There were 8 people on the course and 3 of them cut themselves so badly that the accident book had to come out. Once my design was complete and I'd cut out around my image it was time for the exciting part of printing it onto paper. I was given a sponge roller and some black acrylic paint and I carefully rolled the paint all over the surface of my design. I tried several thicknesses of paint and I found that I much preferred the effect I got from a very thin coat of paint. I should probably confess here that my print isn't exactly as I had intended. 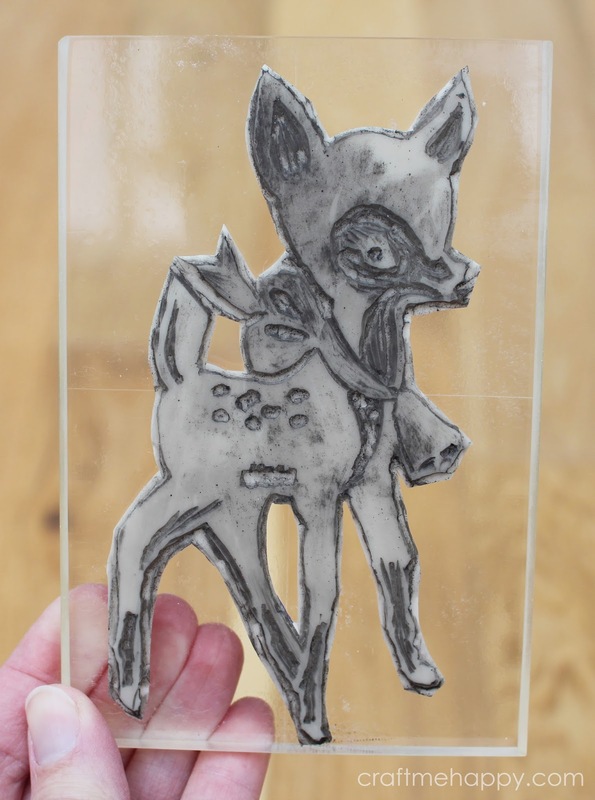 My deer was supposed to be facing to the right, but I thought as it was going to be a lino print I would mirror the image so that it would print facing the right way... However it was actually mirrored TWICE, once when I transferred my image by scribbling on the back and again when it was printed. So for future reference I now know that I don't need to flip my print out image if I'm going to transfer my design in the same way again. As the course was designing and lino printing stationery I was given a Kraft notebook, some Kraft cards, a set of gift tags and some brown wrapping paper to embellish with my design. 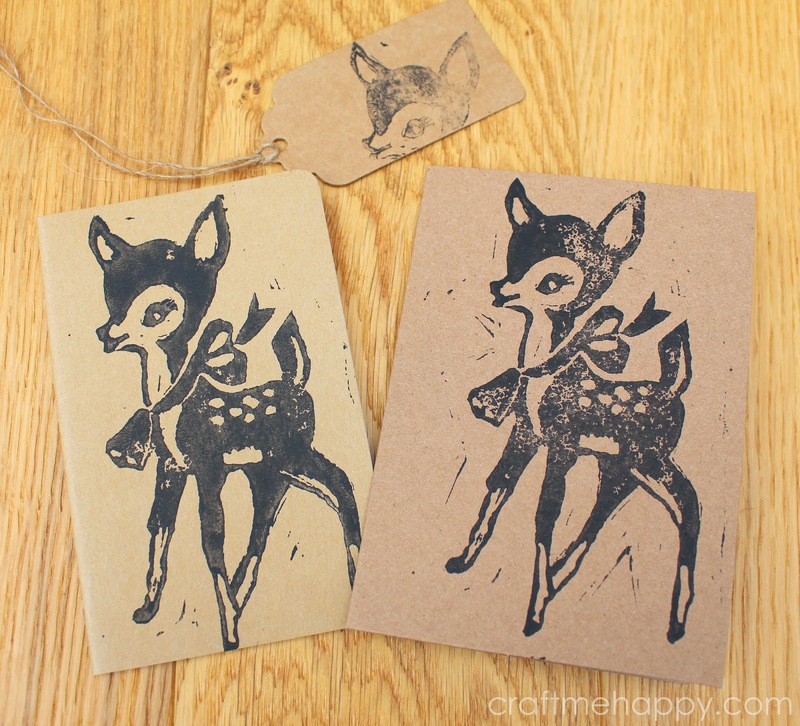 I love the natural look of brown Kraft card and paper and the lino cut images complement it perfectly. However I wasn't overly enamoured by the extra lines I was getting in the background and, as you can see, I was struggling a little to get my design central. I decided to take a break, go home and experiment further in my own time. I know the extra lines are supposed to be part of the charm of lino cutting, but I just prefer a cleaner finish. The next day I got out my scalpel and cut away the background of my design so that I would get a clean background. Also with the background cut away I would have a much better idea of where I was printing. With my background gone, my lino cut was starting to feel a lot more like an unmounted rubber stamp - something I'm a lot more familiar with, so I got out my stamping and embossing supplies and had a little play. I temporarily attached my lino cut to the largest clear acrylic mount I have with a glue stick and started experimenting with different inks and embossing powders. 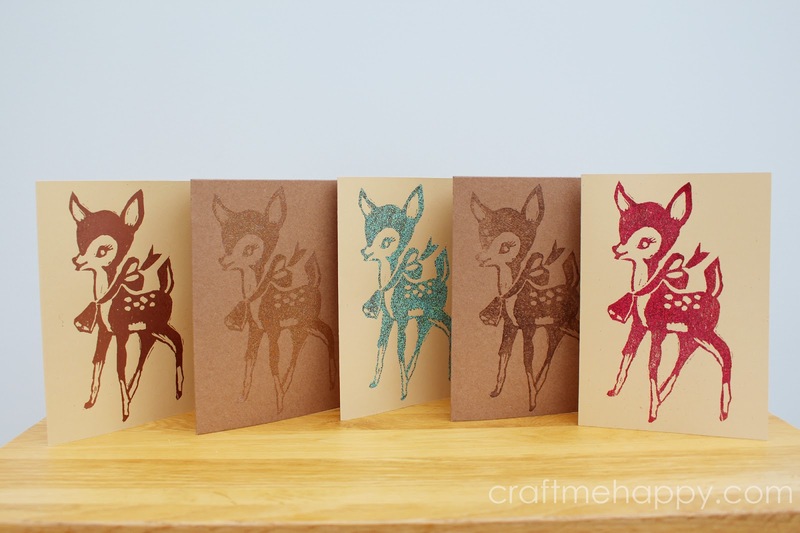 Here are some of the results using a mixture of Versamark Watermark Ink Pad and various embossing powders. I think these two are my favourite. 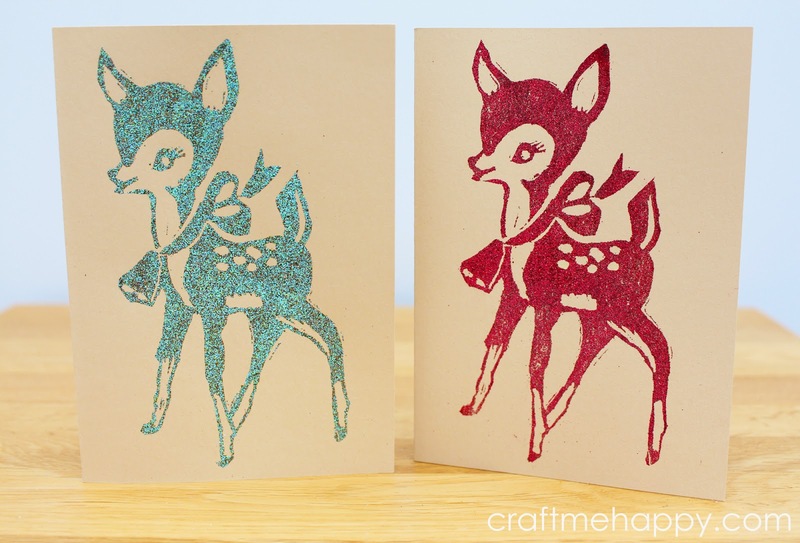 They're stamped with the Versamark Watermark Ink Pad and then heat embossed with verdigris and red sparkle embossing powders. Unfortunately the photo doesn't do it justice, but the red one glitters gently with a very subtle sparkle. I love how it maintains the look of a hand cut lino print, with just a hint of the cutting lines remaining, but it has a clean, fresh sparkle to it. Lino cutting is such a rewarding craft - there's something about wielding a sharp blade and carving your own design into a solid block that is incredibly satisfying. I feel truly inspired after my day at The Itch Gallery, being surrounded by beautiful objects and seeing the very varied work of all the other students really sparks the imagination. And if nothing else, at least I've got my Christmas cards and wrapping sorted! You can help support my blog by using the Amazon Affiliate links. If you purchase from one of my links I will be compensated. This goes a small way towards funding further projects.